Mr. Lawrence William Berghuis, age 61, passed away Saturday, June 2, 2018. He was born in Muskegon, Michigan on January 21, 1957 to Clarence & Julia (Slovic) Berghuis. 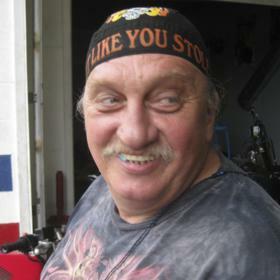 Mr. Berghuis had been a self employed mechanic for years who enjoyed motorcycles, dune buggy's and fixing things like lawn mowers and snowblowers. Sons, Michael (Katie) Berghuis, Joseph Orcutt, Larry (Chancy) Berghuis, Christopher (Monica) Woodruff; daughters, Julie (Steven McCombs) Berghuis, Angela Berghuis; 16 grandchildren; great grandchild; brothers, Leonard (Tracy) Berghuis, Leroy (Donna) Berghuis; sisters, Rosemary (Gary) Charles, Dorothy Berghuis; many nieces, nephews, cousins and friends. He was preceded in death by his parents. Saturday, June 9, 2018, 11:00 am at the Clock Chapel - Muskegon with Rev. Carlos Ramos officiating. Interment in Oakwood Cemetery. Friday, 1:00 pm to 3:00 pm and 5:00 pm to 7:00 pm at Clock Funeral Home - Muskegon. MEMORIAL: To the Family.